The 55XF8505 is cutely designed and relatively affordable for a 55-inch 4K, HDR-capable TV. Unfortunately, though, that’s pretty much where the good news ends. The set’s use of an IPS type of LCD panel and edge LED lighting means it just can’t deliver the sort of contrast demanded by today’s high dynamic range pictures. 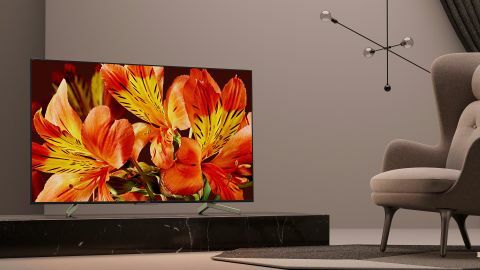 The Sony XF85’s appeal is brutally simple: It’s designed to offer a taste of Sony’s often outstanding LCD TV picture quality to customers who can’t afford to step up to Sony’s excellent XF9005, ZD9, A1 OLED or AF8 OLED high-end models. Unfortunately, though, while the 55-inch version of the TV, the KD-55XF8505, does deliver a bit of Sony’s picture magic courtesy of its X1 video processor, all the good work is ultimately undone by a single fundamental flaw: the use of an IPS panel. As you’re putting the 55XF8505 together for the first time - either hanging it on the wall or popping it onto its straightforward silver feet - you can’t help but notice that it feels much more plasticky in its build than Sony’s more expensive models do. Fortunately, though, you don’t really notice the plasticky finish from a normal viewing distance. Instead, you’ll more likely be pleasantly surprised by the understated, minimalist elegance of the narrow black screen frame and the lack of any visible cabling thanks to cabling ‘channels’ built into the TV’s feet. The one potential fly in the design ointment is the way the 55XF8505’s two feet are positioned quite wide on the TV’s underside, meaning you’ll need a similarly wide piece of furniture to place the set on. Design TL;DR: The XF85 series aren’t the best built line of TVs we’ve ever seen, but they hide their plasticky finish quite nicely behind their crisp, minimalistic lines. Handily, they also hides all your cables, too. The 55XF8505 is pretty challenged in the smarts department thanks to Sony’s ongoing love-in with Google’s Android TV platform: As well as persisting with the same clunky-looking, poorly organised full screen home menu we’ve had to put up with for generations now, Android TV seems to put so much strain on the 55XF8505’s available processing power that everything - including the TV’s set up menus - sometimes runs painfully slowly. You also can’t customise the home screen as effectively as you can most other modern smart TV interfaces, and software updates to the system are frequent and, often, quite large. There are a few positive things about the 55XF8505’s smart TV features. For starters, they support a huge number of apps and Sony has managed to get round Android TV’s problems with catering for the UK’s local catch-up TV apps by including YouView. This brings together the key BBC iPlayer, ITV Player, All 4 and My5 terrestrial broadcaster catch-up services, and lets you find shows you may have missed via a backward-scrolling electronic programme guide. Finally, the Android TV platform now supports direct Chromecasting to the TV, as well as Google Assistant and Alexa voice recognition functionality. Smart TV TL;DR: Android TV is as unhelpfully laid out, buggy and sluggish as ever. Only here it seems to have an even more detrimental effect than usual on the running speed of the TV’s set up menus. As we’ll see later, the XF85 series is so flawed with HDR playback that we’d argue that it’s only really worth considering as a standard dynamic range television. But in truth, it’s far from perfect even with SDR’s limited light and colour range. The problem, basically, is that the type of LCD panel - known as IPS - the 55XF8505 uses just can’t deliver a convincing black level/contrast performance. The way IPS panels work means that dark scenes tend to look very grey and washed out - a problem which can also see subtle shadow details getting lost in the ‘mist’. This is all especially true when, as with the 55XF8505, an IPS panel is lit from its edges rather than directly from behind. And even more so when, again as with the 55XF8505, the edge lighting doesn’t have any local dimming to help it concentrate light only where it’s needed in a picture. Even though SDR content requires much less brightness than high dynamic range content, the 55XF8505 struggles to deliver anything approaching a convincing black colour during dark scenes on Blu-ray or DVD, leaving them looking flat and unconvincing. Not having very satisfying black levels also reduces the sense of vibrancy and dynamism of the 55XF8505’s colour palette. Rich colours in mixed brightness shots are diminished both by not having deep blackness to ‘bounce off’, and by the same uncontrolled light pollution that upsets the screen’s black levels. We should say at this point that IPS screens do have an advantage over their more contrast-friendly ‘VA’ rivals in the shape of a wider effective viewing angle. However, this extra viewing angle only amounts, I’d say, to an extra 10-15 degrees each side over what most VA panels can manage. So unless you have a room set up where the TV routinely has to be watched from the side, we wouldn’t say IPS’s viewing angle advantage comes close to compensating for the flaky black levels. The 55XF8505’s dark scene woes are made to look all the more unfortunate by the fact that in other ways its pictures are quite superior for its money. Thankfully, HD pictures are upscaled to the screen’s native 4K resolution very nicely by Sony’s X1 processor. There’s a touch more noise around than you get with step up Sony TVs that use the more powerful X1 Extreme processor - especially with heavily compressed digital sources - but compared more fairly with similarly priced TVs, the 55XF8505 looks unusually clean and crisp with ‘legacy’ image content. The X1 processing also manages to deliver clean, natural motion reproduction, even while it’s simultaneously having to come up with millions of extra pixels to convert HD to 4K. HD/SDR Performance TL;DR: All looks fine with bright, colourful content, and Sony’s picture processing is superior to most. Unfortunately, though, dark scenes are left looking unconvincing and drab by the screen’s inability to deliver anything close to true black. With most reviews these days, it’s in this section where we expect a TV to really come into its own. Unfortunately, though, with the 55XF8505 the exact opposite is true. The issue, again, is its use of an IPS panel. But this time the IPS issue is elevated to a whole new level by the way Sony’s TV needs to ramp up its brightness to cope with the much more taxing demands of high dynamic range sources. Even though the 55XF8505 can only deliver a little more than 500 nits of peak brightness (on a 10% white HDR window test), this still proves too much for the IPS panel to handle. Any scene that’s predominantly dark but includes a bright element or two looks painfully grey and washed out. As well as being distracting in itself, this issue also greatly reduces HDR’s impact. After all, HDR isn’t just about brightness; it’s actually about the range of light on show, from the darkest parts to the brightest parts. Yet with the 55XF8505 there aren’t really any ‘dark parts’ worthy of the name. That 500 nits of peak brightness also means that the brightest highlights don’t achieve the punch you get with more premium LCD and OLED TVs. Sony’s XF9005 step-up LCD models, for instance, achieve pretty much twice as much peak brightness as the 55XF8505. The extra problems the 55XF8505 has controlling its light with HDR sources also exaggerate its problems with dark colours, and shadow detail in dark areas. Dark colours tend to look unnatural and wan, while shadow details can routinely disappear into the low contrast mist. If there's one advantage here it's that the extra brightness HDR delivers helps to emphasise just how crisp and detailed the 55XF8505’s native 4K pictures look. The difference between 4K and HDR really is startlingly pronounced - and thanks to Sony’s excellent motion processing, the pristine clarity of native 4K images remains more or less intact even when you’re watching sport or an action movie. One final solid aspect of the 55XF8505’s performance is its ability to produce images just 30ms after receiving image data at its inputs - provided, anyway, that you’ve got the Game picture preset selected. This makes it a functional if not spectacular gaming monitor. 4K/HDR TL;DR: While bright scenes can look pretty good, the 55XF8505 just can’t handle dark HDR scenes at all. While the 55XF8505’s pictures are below average, its sound is quite decently above par. It can go loud without its sound becoming distorted or flat, and it casts its sound well clear of its physical frame to create an impressively immersive effect. You can pick out every detail in a subtle film mix, voices sound well-rounded and convincing, and the speakers even have enough power to deliver a genuine sense of expansion when films transition from talky bits to high-octane action. There’s not enough bass to make the 55XF8505’s sound truly outstanding. But it’s certainly better than you would normally expect from a lower mid-level 4K TV. Sound performance TL;DR: Good detailing joins forces with a powerful, open mid-range to make the 55XF8505 a much more satisfying performer with its sound than it is with its pictures. We haven’t yet seen many other lower mid-range TVs that we might compare against the 55XF8505. You can still buy some interesting sets from last year at discount prices, though. The Sony KD-55XE9005, for instance, uses a VA panel and direct LED lighting to deliver a far superior picture, and can currently be bought for £999. Football fans should note, though, that at the time of writing it has not been confirmed that the 55XE9005 will be able to play the BBC’s 4K HDR World Cup streams. Also extremely tempting if you’re after a TV for a predominantly bright room is the Samsung Q7F QLED TV. This uses an outstanding screen filter and ultra bright, ultra colourful ‘QLED’ Quantum Dot picture technology to deliver some of the punchiest HDR pictures seen to date. The only catch is that its use of edge LED lighting means it only delivers so-so black levels when you’re watching films in a dark room. Finally, you can get Sony’s far, far superior KD-55XF9005 for £400 more. And it’s worth every cent of that. We really wanted to like the 55XF8505. We’d hoped it was going to be a more affordable way for AV fans to get their hands on Sony’s excellent video processing. Unfortunately, though, in its quest to reduce costs Sony has ended up putting a low-contrast IPS panel at the 55XF8505’s heart. A decision which has unfortunately made the set pretty much a no go zone for anyone interested in unlocking high dynamic range technology’s huge picture quality potential.